Holly Holm has said since the UFC 196 post-fight press conference that she wanted a rematch with Miesha Tate. Her manager Lenny Fresquez made that known multiple times to UFC brass over the last month. That has never been in question. Holm badly wanted the rematch, for sure. But the former champ also believes that most observers wanted it, too. 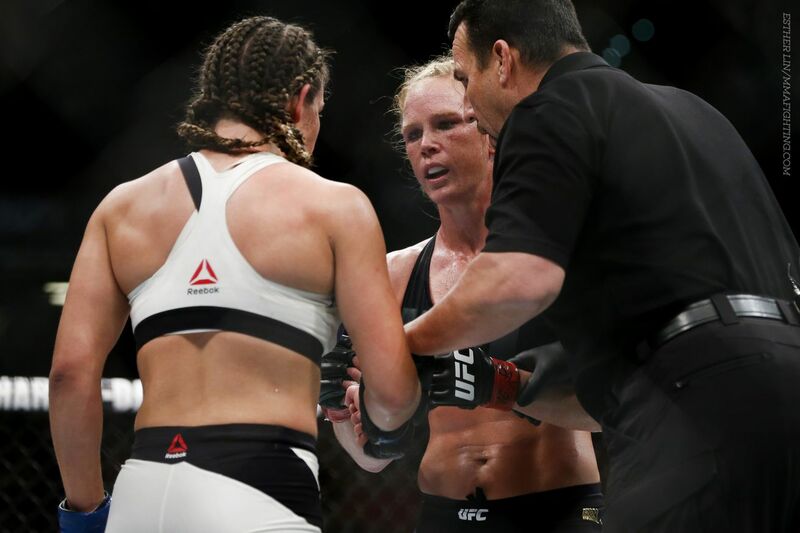 Tate beat Holm in the co-main event March 5 in one of the best women’s fights in MMA history. Holm was winning on the cards going into the fifth round only for Tate to drag her down and choke her out with just minutes remaining. Tate is the only challenger in UFC history to come from behind and finish in a final round. All of those factors make Holm feel more than ever that a rematch with Tate was the fight to make. That rematch won’t happen, at least not right now. Tate will make her first women’s bantamweight title defense against Amanda Nunes at UFC 200 on July 9 in Las Vegas. Submission Radio #118: Chris Weidman, Stephen Thompson, Tyson Pedro, Tommy Toe Hold + more!